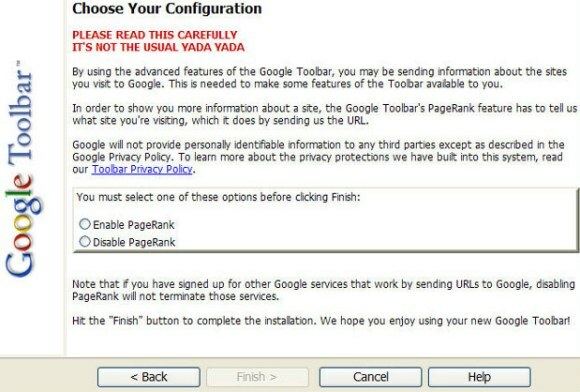 You must have seen this message when installing Google Toolbar in Internet Explorer: "Please read this carefully. It's not the usual Yada Yada." 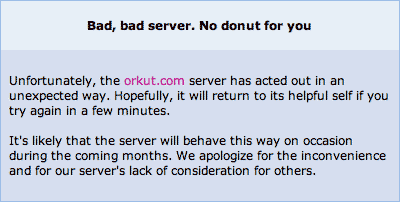 If you've ever used orkut, you probably remember the famous error message: "Bad, bad server. No donut for you." 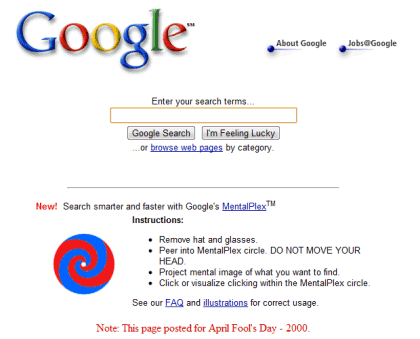 Remember Mentalplex, Google's first April Fools' Day joke? What about the "10 things Google has found to be true"? All of these were written by Doug Edwards, Google's director of consumer marketing and brand management from November 1999 to March 2005. Doug was "the voice of Google", the one who wrote the text for Google's corporate pages and FAQs. 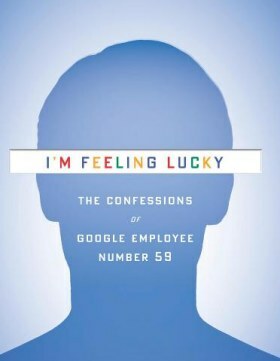 He's now the author of the book "I'm Feeling Lucky" (Google Books, Amazon), which tells the story of the five years he spent at Google. "Google was becoming my own personal publishing platform. (...) We had built a global bully pulpit and my voice rolled forth from it, My thoughts, my ideas, my imprecations would be seen by more people than read the New York Times or watched a network newscast. I was the man behind the curtain giving voice to the all-knowing Oz, and I tried not to let it go to my head," remembers Doug. He came up with the name "AdWords", a cross between "AdsDirect" and "BuyWords", two other names suggested for Google's online ad service. Doug was the marketing directer of a company whose founders didn't want to spend too much money on marketing. "Efficiency. Frugality. Integrity." 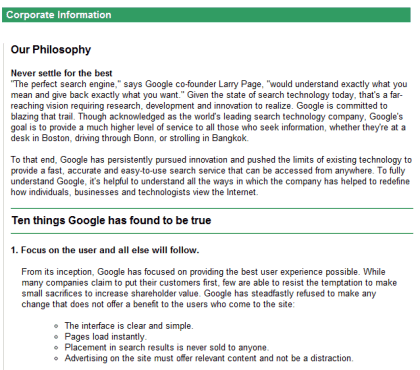 These were Google's most important principles. "Growing by word of mouth suited Larry and Sergey's animosity toward advertising. They scoffed at profligate startups and their Superbowl spots, because TV ads lacked accountability. (...) 'If we can't win on quality', [Larry] said quietly, 'we shouldn't win at all.' In his view, winning by marketing alone would be deceitful, because it would mean people had been tricked into using an inferior service against their own best interests." Actually, Google created a marketing department because "a board member or a friend from Stanford had insisted the founders needed people to do staff that wasn't engineering." Douglas shares a lot of interesting things about the early days of Google, when the company struggled to rewrite Google's original code, build a scalable infrastructure, convince major portals like Yahoo and AOL to use Google's search technology and find a way to monetize search. Google started with a great idea, but turning a research project into a successful company wasn't easy. Hiring smart people and creating a flat organization that replaced bureaucracy with meritocracy helped a lot. "Great things would come from packing [engineers] tightly together so that ideas bounced into one another, colliding and recombining in new, more patent ways," remembers Douglas. Google has always been the anti-corporation, where you could question authority and where engineers were in the driving seat. That's probably the reason why "don't be evil" became Google's mantra. As Google became a bigger company, "don't be evil" helped Google stay true to itself. Even when Google did evil things, like testing ads mixed with search results, the mantra was always there to show the right path. Douglas had an increasingly important role: from a marketing director that tried to promote Google without spending too much money to the voice of Google, the one who wrote or adjusted most of the text from Google's pages. He questioned many decisions of Google's co-founders, from adding daily doodles to creating an ad service that didn't require moderation, but he later realized that they were great ideas. A former marketing manager at Mercury News, Douglas had to change a lot of habits at Google, while learning a lot in the process. His decision to leave the company came after he realized that a major Google reorganization made his role unnecessary. "I had started at a small startup as a big-company guy. Now I was leaving a big company as a small-startup guy." Douglas thinks that Google's main flaw is the "impatience with those not quick enough to grasp the obvious truth of Google's vision." After leaving the company, he found himself "impatient with the way the world works" and discovered a lot of problems in everyday life. "Smart people, motivated to make things better, can do almost anything." That's one of the most important things about Google: the motivation to make things better at a global scale. Creating a better browser, a better mail service, an ad service built around relevant ads, a translation service that constantly improves shows that Google cares a lot about finding the right answers to the important problems. Great book and nice post. I use the Google toolbar to check page rank and so forth, it is a great tool. Wish they would update the toolbar to work in Firefox 5 and above without having to hack it. I have problems making comments to others blogs using my google account anymore. Seems to have stopped working when Google+ came out. Any ideas? OT but does Google have a suggestion box for Google Books search? I was going to suggest the idea of "virtual stacks" based on the Dewey Decimal System so you can virtually browse like you used to be able to do in university libraries. In my mind I see vertical spines arranged horizontally across the windown with titles clearly legible. Just like in the library. Pass it on.